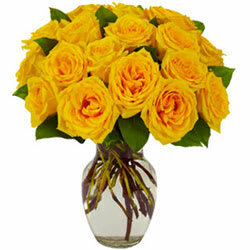 Let others feel special with this Majestic Collection of 15 Yellow Roses in a Glass Vase on special days of celebrations. Impress your dear ones by sending this Magical Assemble of 18 Yellow Roses in a Glass Vase and elegantly brighten up their mood instantly. Impress your dear ones by sending this Magical Assemble of 24 Yellow Roses in a Glass Vase and elegantly brighten up their mood instantly.